Suffolk County Police Seventh Squad detectives are seeking the public’s help to locate an East Moriches woman who has not been heard from since yesterday afternoon. Marie Vallanti, 21, of East Moriches is missing. Detectives are asking anyone with information to contact the Seventh Squad at 631-852-8752 or 911. East Moriches, NY - February 23, 2017 - Suffolk County Police Seventh Squad detectives are seeking the public’s help to locate an East Moriches woman who has not been heard from since yesterday afternoon. 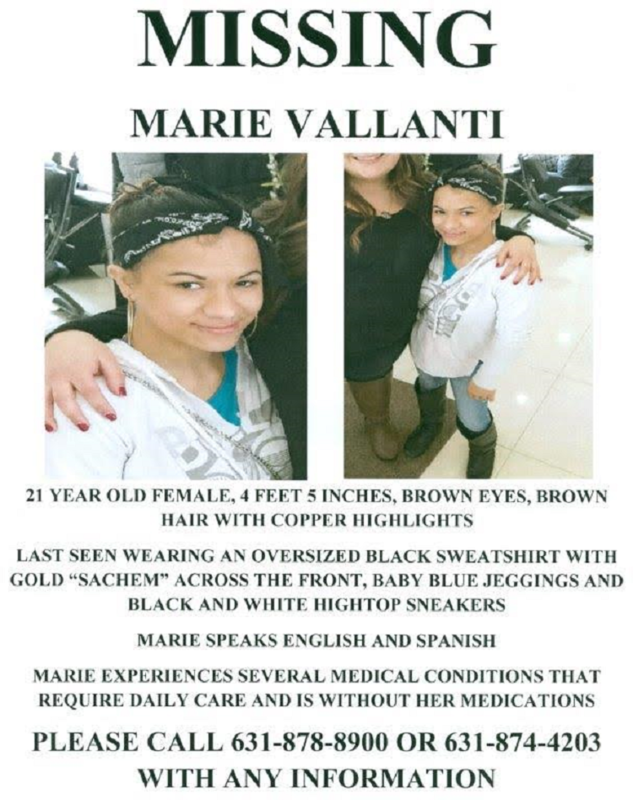 Marie Vallanti, 21, was last seen by staff at her residence at the Independent Group Home Living (IGHL) located at of 106 Pine St., East Moriches at approximately 3 p.m. on February 22. Vallanti is white with brown hair and copper highlights and has brown eyes. She is 4 feet 5 inches tall and weighs approximately 88 pounds. She was last seen wearing an oversized black sweatshirt, with “Sachem” written in gold across the front, baby blue Jeggings, and black and white high-top sneakers. Vallanti speaks both English and Spanish. Detectives are asking anyone with information to contact the Seventh Squad at 631-852-8752 or 911. Subject: LongIsland.com - Your Name sent you Article details of "Missing Person Alert: 21-Year-Old East Moriches Woman Missing"